Simple one-click batch conversion of files added to a list and exporting them all to 5 popular file formats is what DocuFreezer known for. The new version of DocuFreezer is a major update, which enriches the ability to OCR scanned images, convert DWG and DXF drawings to searchable PDF and images, faster processing engine, and many other improvements. 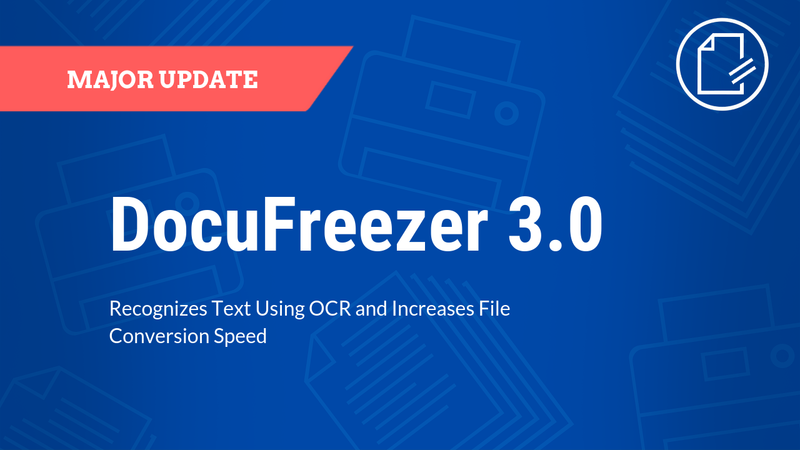 DocuFreezer has a new OCR feature – now you can convert files so that output files will have recognized text, which can be copied or edited. The quality of text recognition will depend on the original file. So far, the program can recognize text from TIFF, PDF, JPEG files, and six languages are supported. DWG and DXF formats were added to the list of supported file types. With the new DocuFreezer, not only you can convert DWG and DXF drawings to bitmapped PDF, but also make searchable PDFs out of them. Thus, the output files will have searchable text, but not curved lines. We added a new option to process Excel types of data (XLS, XLSX). Now you can have a separate copy of each worksheet after the conversion instead of having all sheets merged. DocuFreezer has undergone a large number of fixes and improvement to make it closer to the perfect batch file converter. The new version converts Word to PDF three times faster than before, processes high-resolution files better, and gets many stability and performance improvements.